There are a couple of different ways to add a new company. From the top menu you can click on the icon next to the companies link. Alternatively you can click on the 'Add Company' button on the companies page. The company name is the only required field. When you enter the company name we will attempt to find any duplicate companies. When a duplicate is suggested you can dismiss the suggestion or click on the company suggested to go straight to that companies detail page. When adding a new company you need to place the company into a territory. By default the territory selected is the one to which you are the assigned primary. You can add or modify territories via the admin section. Territories control access privileges for your team members. 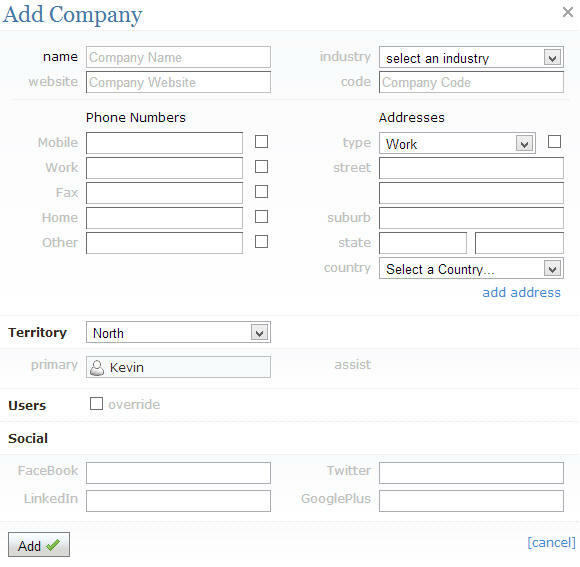 You can optionally override the user assignment and manually set the companies primary and assist members. Beyond the obvious addresses and phone numbers you can also set a searchable company code, assign an industry and also social links. You can add industries via the admin section.